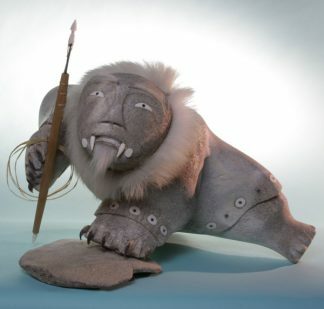 Inupiaq artist Richard Olanna was born on February 15, 1962 in Shishmaref, Alaska. This small spit of land is 110 miles north of Nome, Alaska in the Bering Sea. Most residents in Shishmaref live a subsistence lifestyle; hunting seals and caribou, and living off the land. Richard has been carving for over 20 years. He is the son of Elliot Olanna and learned to carve from his father. Richard’s work can be found in museums and galleries, and is sought after by collectors. 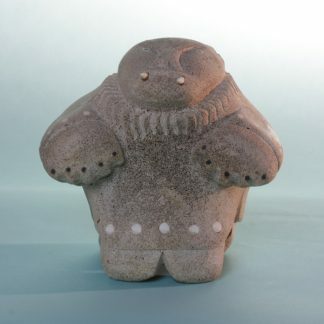 Whalebone carving, an old Inupiaq art form, has known to exist in his culture for over 2,000 years. His special trademarks are large whalebone jaw and rib sculptures. Usually hunters, dancers and fisherman in transformation with an animal form. He also uses vertebrae and scapula bone. The faces on Richard’s sculptures imitate the facial features of his father, Elliott. For his age, Richard is a very traditional man, combing the beaches for whalebone and carving are what he enjoys most.